Charter schools were developed in the wake of the Brown v Board of Ed decision, which found that racially segregated public schools were illegal; charter schools let white supremecists skirt the decision by diverting public funds into private schools that could exclude Black children. Today, the charter school movement has evolved into a darling of billionaires and vast, illegal dark-money pools, working in alliance with racists and Christian Dominionists who want Biblical doctrine taught at public expense. Like the Reagan coalition, the fundamentalists supply the warm bodies, the billionaires supply the seed capital, and then the billionaires make out like bandits while the poor evangelical rank-and-file get screwed. But even if you want to send your kid to a public school, charter schools can make it impossible to make such a choice. Charter schools can cream off the kids with wealthy parents, high test scores and no special needs, sucking money out of the public system, which still has the same per-pupil funding that has to stretch farther to cover fixed costs (just because your students leave, it doesn't make your school cheaper to heat or maintain). The results is that schools end up raiding the per-pupil educational budget to cover fixed costs, leaving the public system with a disproportionate fraction of kids who need extra support, and less money per pupil to pay for it. So many parents who want to support the public system still put their kids in charters to avoid this mess, making it even worse. 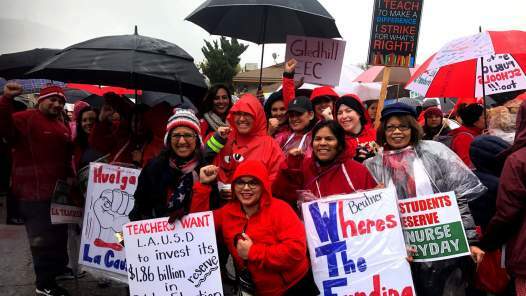 That's why the LA teachers are on strike: to stop the stealth privatization of our public schools and ensure that every kid gets the education they're entitled to.